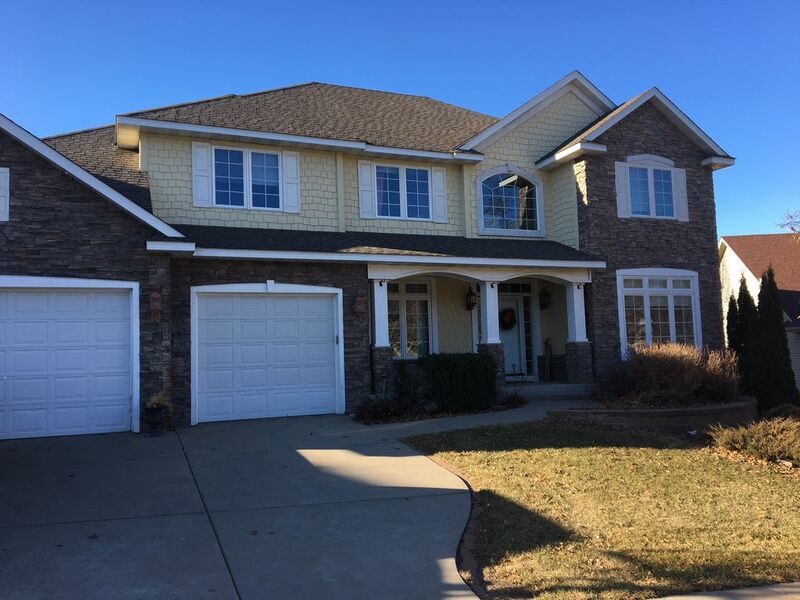 Fabulous 3 level family home in The Wilds Golf Course community near Mystic Lake Casino. Beautiful views, movie theater, pool table, game room, large patio and deck with outdoor fire place as well as huge kitchen and entertainment area. Will hold up to 10 people comfortably. Great neighborhood near upscale restaurants and night life. Several of Minnesota's finest golf courses are within 5-10 minutes - The Wilds, Meadows at Mystic Lake, The Legends and Hazeltine. Mystic Lake Casino host's many headline entertainers and is 3 minutes away. Downtown Minneapolis and MSP Airport are within 30 minutes. House was as advertised. It was perfect for our needs. This was a large home, and comfortable. The family definitely lives in the space, so be prepared to have a lot of their items around. The listing said there would be wifi and cable/satellite, but there was not. This home was great for our group, but it does feels like you are staying in someone else's home, not a vacation home or something only used for guests. The owner was friendly and accommodating. We needed to come a day early, and he was very easy to work with and changed the reservation for us. We had a great time. The location was so close to a lot of fun attractions. Everyone had a great time. The house was perfect for our needs. This was a great space to accommodate a large group of people, as there are lots of different spaces for people to be in smaller sub groups. I believe the owner lives here part time so there is quite a bit of decent kitchen supplies, though only one cutting board that I could find. The dishwasher wasn't working when we were there, but the owner said he was going fix it asap. Great steam room in the basement; the hot tub is in the master bathroom, not a standalone tub for multiple people outside. Play fort and nice back yard that is good for kids. Lots of family pictures and religious decor . We stayed 4 nights, celebrating family milestones. Pulling up to the house, we thought it was beautiful & in a fantastic neighborhood. Close to all the activities we had planned at MOA & restaurants. However, disappointed at the condition of the house. Spent the first day cleaning so that we could cook in the kitchen, which included cleaning the dishes & utensils we were going to use. The dishwasher wouldn't close so we had to hand wash all dishes. Also was unable to enjoy the outdoor fireplace because the seating area had an outdoor couch that was covered in mold & mildew & the cushions were ripped to shreds. Not to mention that the outdoor garbage can on the deck was completely full of used baby diapers. Hot water was non existant, which meant mostly cold showers for all eight of us. Listing stated that besides a king bed, there were also two queen beds & one double bed. However there was only one usable queen & two double beds. Additionally, light bulbs were out in many key areas; bathrooms & bedrooms. Overall was disappointed for the amount of our total invoice. Very sorry our home did not live up to your standards. We still live in the home with our adult children. The hot water heater is working fine - not sure why you had issues - Perhaps the number of people taking showers at same time. The dishwasher simply had a roller wheel stuck in between the door hinge - fixed. There are 2 king beds, 1 queen a double bed and bunk beds in the bedrooms as well as a queen air mattress and a queen sofa bed. Will take a look at the deck furniture and replace accordingly. We stayed at this property and the air conditioning went out and we had some communication with the owner the day it went out but there was no follow up to let us know if there was a resolution to the lack of air conditioning. We had three small children and a diabetic in the house at the time and the conditions were way too hot. We had to go and locate the window screens and install them ourselves in order to get some air movement in the house. Also upon return of our trip all three of the little ones with us ended up with head lice. We traced our steps and there wasn't one activity we did where they would have interacted or been that close with other children to come in contact with bugs. The house was not kid friendly at all. One of the little ones found a real sword in a closet, thankfully there was an adult right there to relocate the weapon out of reach of the kids. There were also many personal items located through out the house that we needed to make sure the little ones did not touch or we had to move them up high enough so that they would not break them in case they would touch them. There was a lot of stuff in the cupboards which we then had to make room on a counter for our food. There was a deck board on the upper deck that was very weak as well. The outdoor furniture was not great for sitting on either. Very sorry our home did not live up to your standard!! We still live in the home with our adult children and are sorry it was not child proofed. We do try to keep personal items locked up or in closets with closed doors. The sword you refer to was used to Knight our sons in to manhood based on the book Raising Modern Day Knights. The air conditioning is working - the repair man did visit the home during your stay and stated "the compressor was over worked from the temperature turned too low." Lastly, I can assure you there was no evidence of lice prior to or after your stay and the home is professionally cleaned and disinfected post use.